Vegetarian Empanadas: Crispy Homemade Empanada Snacks! 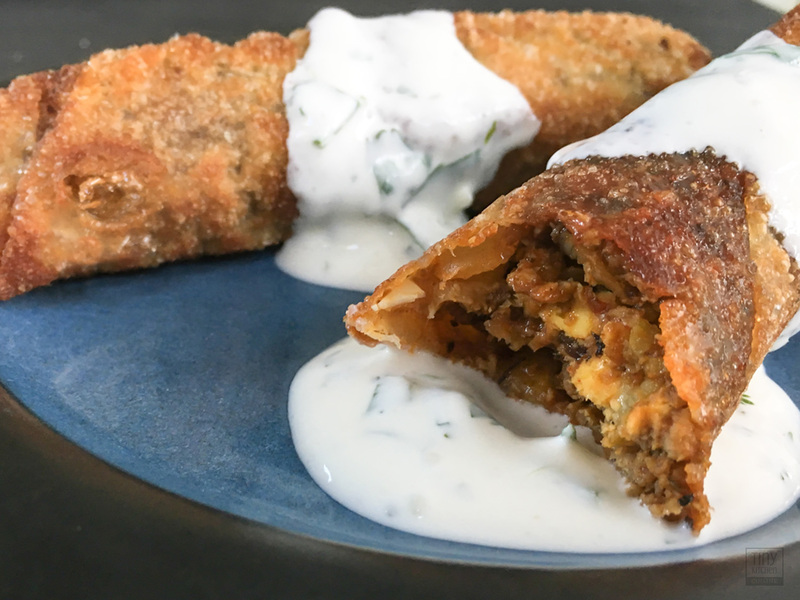 With all the flavors of a traditional beef and chorizo empanada, this recipe for vegetarian empanadas will surely hit the spot! 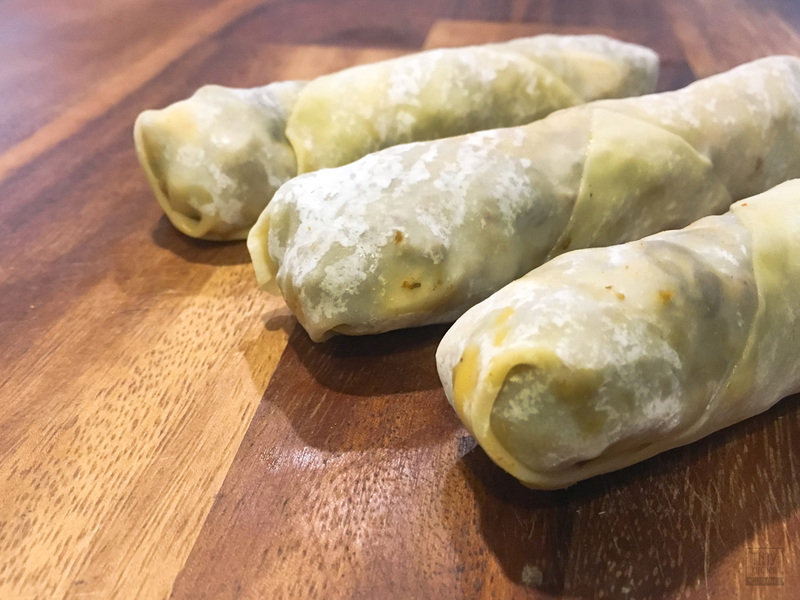 Additionally, you can spare yourself the struggles of making a traditional empanada dough or wrapper by simply wrapping your empanadas in egg roll wrappers instead. The lightness of the egg roll wrapper won’t get too greasy or overpower the flavors of your vegetarian empanada filling. These tasty morsels will fry up to become golden brown, crispy, and delicious! They also freeze well for a quick and easy snack. An empanada is a hand pie filled with all different types of savory and sweet fillings. It’s a versatile food that can be served as a snack, appetizer, tapas plate, or as a main entree. Read more about traditional empanadas here. Because there are so many varieties of filling, it’s hard to screw it up. As long as your filling is flavorful and your crust is crunchy, you’ve pretty much nailed it. So what is an empanada roll? Sometimes cutting a few corners can lead to interesting and wonderful results. One day I got lazy and had a leftover supply of egg roll wrappers in my refrigerator. Replacing dough with egg roll wrappers is not a new concept, but I had never tried it with my empanada filling before. Sure enough, it worked! My husband has been a snob about empanadas since the day I met him. But he not only loved them, he said that they were almost better than the traditional dough version. They were crunchier and easier to eat. I personally like that you can fry these guys without them getting greasy and absorbing a lot of oil and they can be baked with equally good results. As I mentioned earlier, my husband is an empanada snob. He spent a lot of time as a youth in Spain. Since the day we met, he had been talking about two dishes that he loved as a kid. One was a pear sorbet dessert and the other was empanadas. Based off his vague description, I cobbled together a few different recipes and eventually came up with a meaty filling that came close to the one that he remembered. This filling consisted of beef, chorizo, hard-boiled eggs, manzanilla olives, and raisins. Yes, I know it sounds like a strange combination… more on that later. 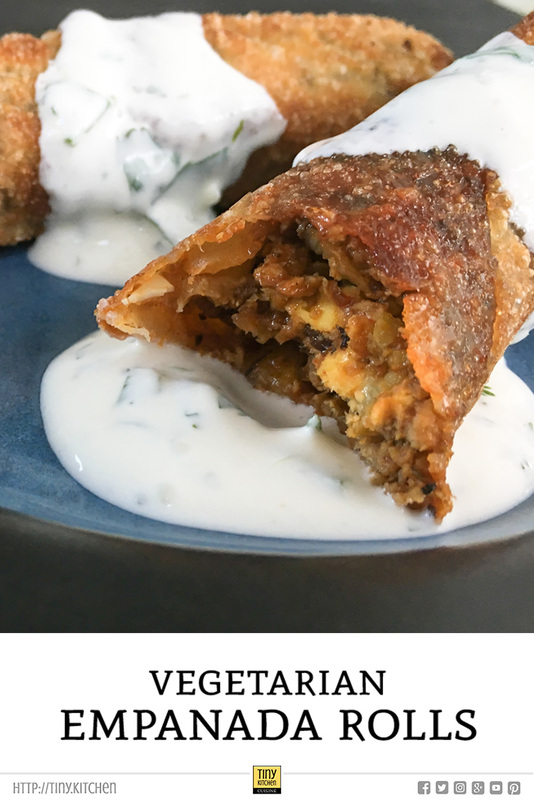 When we decided to shift our diets over to eating mostly vegetarian foods, I was determined to come up with a recipe that recreated the flavors of the beef and chorizo empanadas that we knew and loved. Honestly, I think this vegetarian version comes out even better than using real meat. You get all the flavors of the chorizo without all the greasiness. For this recipe, I’m using Beyond Meat® “Beefy Crumbles” as the base for the filling. You could probably get away with any brand’s beef crumbles, but I like Beyond Meat® because the chunks of faux-meat hold together better and creates a coarse filling. Also, the flavor of their “Beefy Crumbles” is much better than other brands. This is not an affiliated statement, I just like their product. They don’t have that “cardboard” aftertaste that many fake meat crumbles seem to have. I have fed this to an avid meat eater they didn’t know the difference. The biggest challenge in the conversion was the chorizo. Chorizo is a heavily flavored pork sausage used in Spanish cuisine. Since it’s hard to find a decent vegetarian sausage of any type, what I did was look up just the spices to make chorizo and combined them with some fake meat crumbles. Voilà! I had vegetarian chorizo crumbles. Could you use vegetarian chorizo from a package? Sure. But your results might vary because commercially made fake-meat products are all a little different. 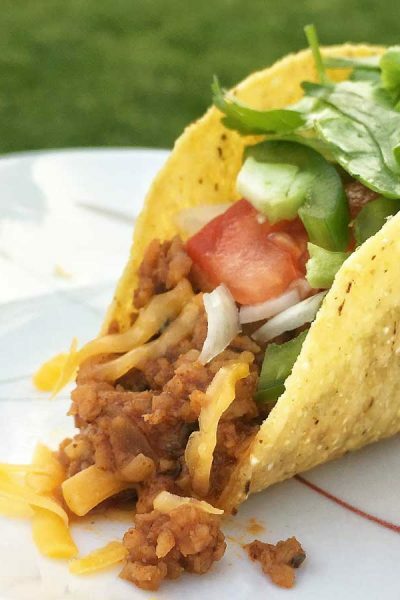 If you do want to experiment with this, I recommend only using 1/2 of the Beyond Meat® crumbles and then whatever vegetarian chorizo you wanted to use. The 50/50 split of beef and chorizo seems to really work for this particular filling. Meat, Eggs, Olives, and… Raisins?! It sounds strange, but here’s what happens in your mouth… The chorizo sausage give you this overall density of spicy savory flavors. The beef provides texture. Eggs lend a creaminess and coolness to the mixture and they play well with the spices of the chorizo. The addition of manzanilla olives (spanish olives stuffed with pimento) add a bite of vinegar and salt that is balanced by the sweetness of the raisins. 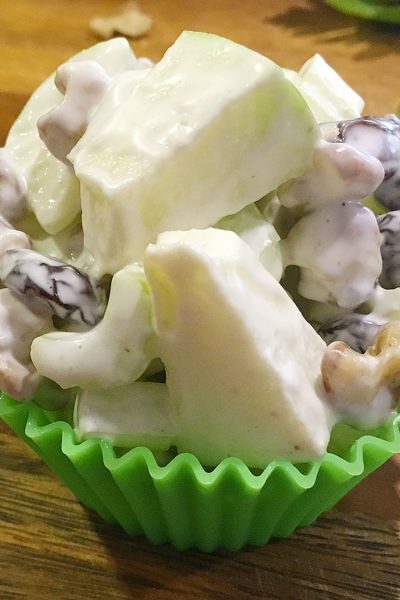 The ingredients are coarsely chopped, so in every single bite you get a different kind of flavor. This keeps the empanada interesting as you eat it. Sometimes it’s a little sweeter because you hit a raisin. Other times it’s a little more tart because you got more olives. It’s a dynamic experience! 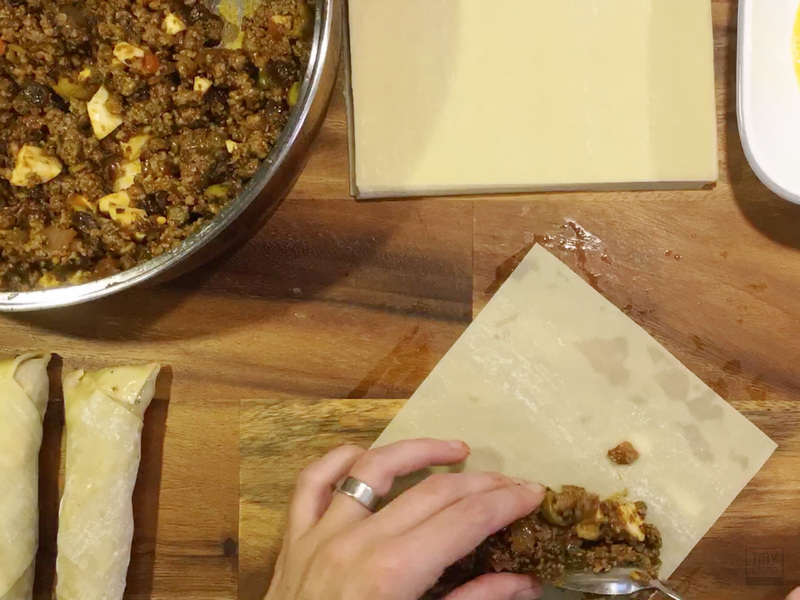 Using the flavors of a traditional beef and chorizo empanada, this vegetarian empanada roll recipe will hit the spot! These tasty meatless morsels fry up to become golden brown, crispy, and delicious. Add olive oil to a large skillet and set over medium heat. Add chopped onions and sauté until they start to get soft. Reduce heat to low. 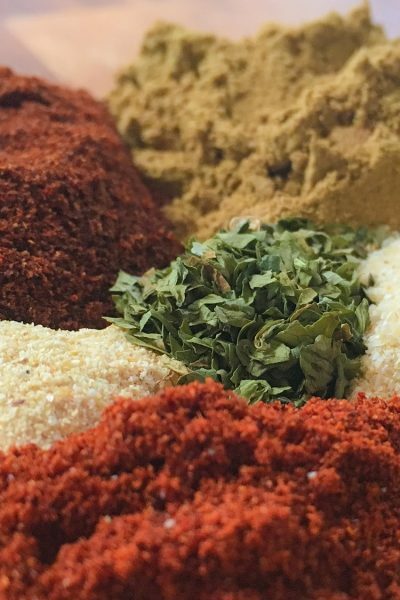 Add white vinegar, cumin, paprika, salt, black pepper, ground coriander, oregano, garlic powder, chili powder, and cayenne. Mix into the onion until fully coated. The texture will be dry. Add frozen Beyond Meat® "Beefy Crumbles" packages to the spiced onions and mix well. Add raisins, olives, and chopped hard-boiled eggs. Fold gently into the mixture to avoid crushing the eggs. Heat for 3-5 minutes until the crumbles begin to thaw. Remove from heat and let cool. Take an egg roll wrapper and place on a flat surface so the corner points at you and it looks like a diamond shape. Place 3-4 tbsp of empanada filling in a line across the middle of the wrapper. Do not run the filling all the way out to the edges. Lightly rub the beaten egg wash around all of the edges of the wrapper. Take the corner of the egg roll wrapper that is closest to you. Fold over the filling mix. Press down gently to squeeze out any air. Squeeze and reposition the filling mixture so it fits snugly against the fold. Take the corners on the left and right of the egg roll wrapper and them fold in toward the center. Press down gently to squeeze out any air. Tuck the corners so that the filling is fully enclosed and fits snugly inside of the folds. Roll the empanada up toward the top corner. Press gently as you roll to squeeze out any air. Run your finger around the wrapper edge to seal. Inspect the empanada roll and make sure all of your edges are sealed and there are no holes or gaps in the corners or folds. Holes and loose edges will cause your empanada roll to fall apart or become greasy when frying. Heat oil to 375℉. Place the empanadas in the hot oil and fry for about 3 minutes until they are golden brown. Do not let your oil drop below 365℉! When fried, set on a rack to drain and serve immediately. Heat your oven to 400℉. Place the empanada rolls on a parchment paper lined baking sheet and lightly brush each with oil. Bake for about 20 minutes or until they are golden brown and crispy. 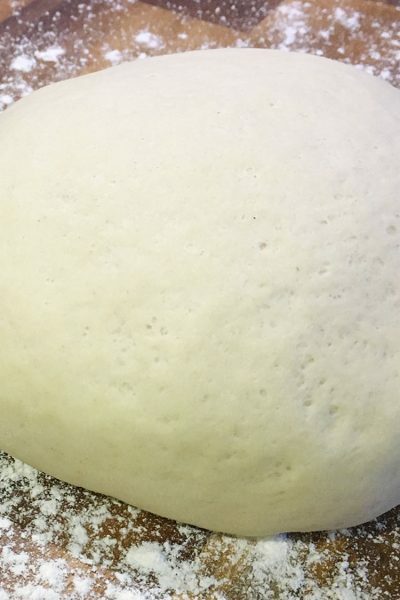 Flip about halfway through for an even crust. A little more difficult than most vegetarian recipes, making vegetarian empanadas is still worth it. It’s not that any single step is difficult; it’s just tedious. It requires a lot of little steps to make it happen. I highly recommend that when you do make these empanada rolls, make a lot of them and freeze some unfried rolls for later. In order to make this recipe, you’re going to need access to a stovetop for the purposes of cooking the filling as well as deep frying the finished empanadas. Clean up for this recipe is fairly easy. You’ll have a knife, cutting board, skillet, bowl, and work surface to wash.
Don’t like to fry? No problem! You will need an oven that can sustain 400℉. Just lightly brush the empanada rolls with safflower oil and bake them for about 20 minutes or until they are golden brown and crispy. I also recommend flipping them about halfway through the baking process. 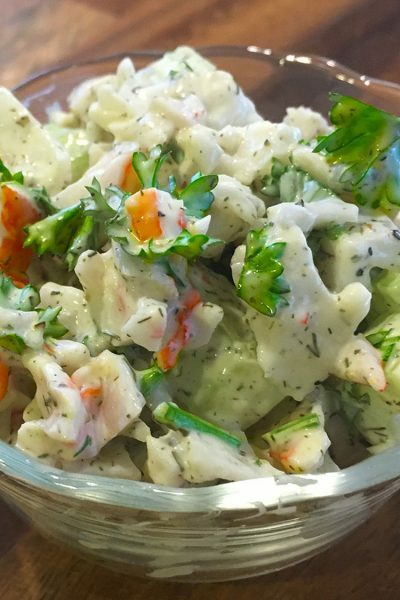 This recipe goes great with dipped in Cilantro Lime Dipping Sauce. 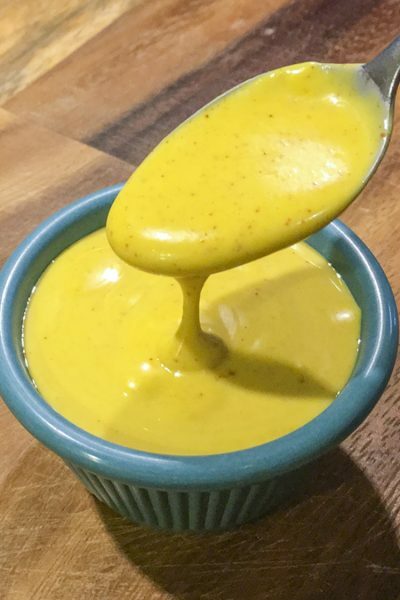 I highly recommend you make take a break from this recipe and make some of this sauce before you start cooking your empanada rolls. If you make a large number of these rolls, you can freeze them and fry them up later. After you are done wrapping the empanadas, lay them out on a flat surface in your freezer so they are not touching each other. Freeze for about an hour until they firm up and then transfer them to a freezer bag for storage. Alternately, if you use strips of parchment paper or wax paper to separate the empanadas, you can bag them up and freeze them straight away. This is my preferred method, but it does generate a little bit of trash. With either method, the goal is to prevent them from sticking to each other. To cook later, just heat your oil and put the empanadas in while they are still frozen. Keep a careful eye on your oil temperature because frozen foods can drop temps very quickly. Do not let your oil drop below 365℉! Cooking time may increase by as much as 2 minutes when you fry from frozen. 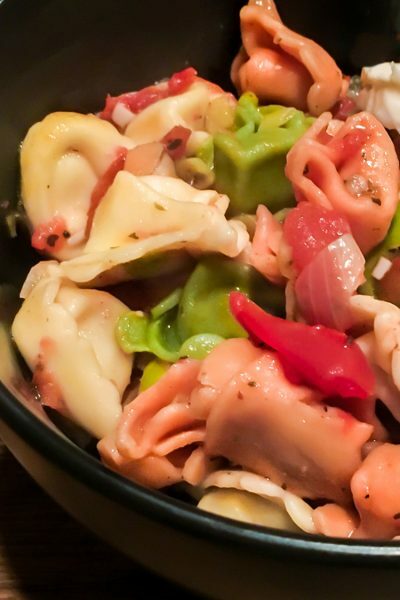 You can also make just the filling and freeze that. This means that if you wanted to make a full batch of the filling but didn’t want to roll all of them at once, you have some choices. Both the filling and the fully-wrapped empanadas will easily keep for several months in the freezer. Lots of work up front, easy tasty snack to whip out of the freezer in the future.